Where do your instructors fall in the EdTech adoption? As an Educational Technologist and an instructor, I’ve seen many faculty members excel in the use of classroom technology and others whom let their fear get in the way of their technical growth. Mark Anderson, @ICTEvangelist, posted a chart that graphically illustrated the Teacher Confidence in Use of Technology. 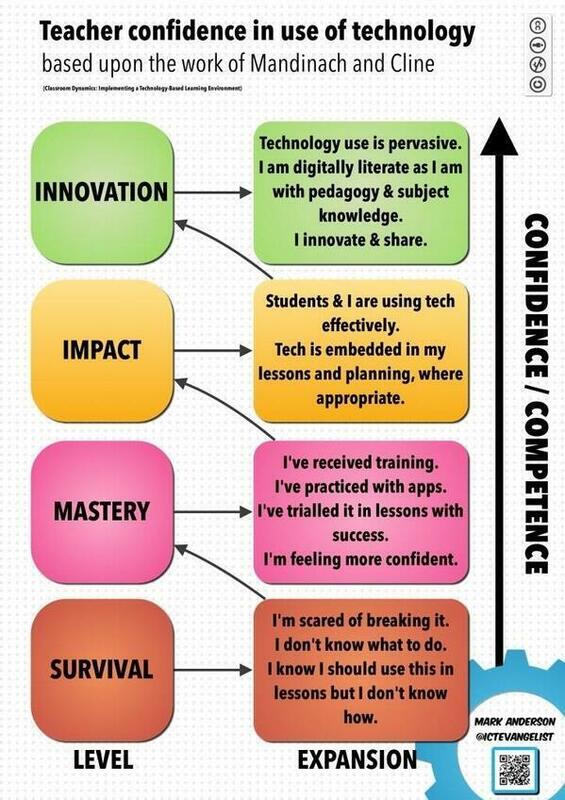 The graph was adopted from the work of Mandinach and Cline and described the stages of confidence related to technology. As confidence and competence grows, instructors are keener to apply the technology they’ve mastered to the classroom. In doing so, the technology can effectively impact the way students learn. The final step of the Confidence graph is Innovation. Instructors have the confidence to use technology seamlessly in the classroom, as well as innovate and share their ideas. It is at this point that I believe instructors demonstrate independence and enthusiasm for utilizing technology. In my experience, I’ve mostly worked with faculty that were between the Survival and Mastery levels. The challenge of an Educational Technologist is to provide enough support and training to help encourage the technological exploration, yet, not be too helpful in that it enables the instructors to lean on you as a crutch when they use technology. Balancing support with autonomy is important. Posted on May 4, 2014, in Educational Technology, Instructional Design, Tausend Talks Shop, Teaching Tools, Technology Management and tagged EdTech. Bookmark the permalink. Leave a comment.